The pilot had returned to the San Vicente reservoir after his third water bombing run and was in the process of scooping another load of water. The speed at touchdown was between 70 and 75 knots, with a left quartering tailwind blowing from 3 to 5 knots. After touching down, the aircraft had been on the water about 2 to 3 seconds when the pilot began to advance the throttle to takeoff power. The aircraft pitched forward from 3 degrees nose up until it reached about a 1-degree nose up attitude. As the pitch changed, he increased back pressure on the elevator control. The pilot said that about that time the aircraft encountered an approaching gust of wind that was visible on the surface of the water. The nose of the aircraft began to bowsuck and the cockpit floor split open and water began rushing into the cockpit between both crewmembers. The wreckage is now stored at the Riverside-March Air Museum. 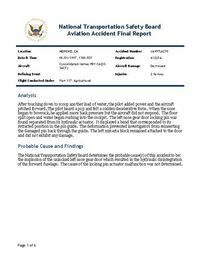 PROBABLE CAUSE: "The implosion of the unlocked left nose gear door which resulted in the hydraulic disintegration of the forward fuselage. The cause of the locking pin actuator malfunction was not determine"